I have been wanting to attempt a Keto Sausage, Biscuits and Gravy Recipe but hadn’t done so until last night for dinner. Does anyone else love having breakfast for dinner like we do? It’s the best! Most of the time we make our Low Carb Keto Fluffy Waffles recipe with a side of bacon or sausage but not this time. The hubby and I tagged team making dinner tonight. We were supposed to go out to dinner but the weather was ugly and nothing around us sounded appealing. I’m done with bunless protein style burgers on the go. I wanted something different. I already had a pound of country sausage thawed that I planned on making for breakfast so that was it! 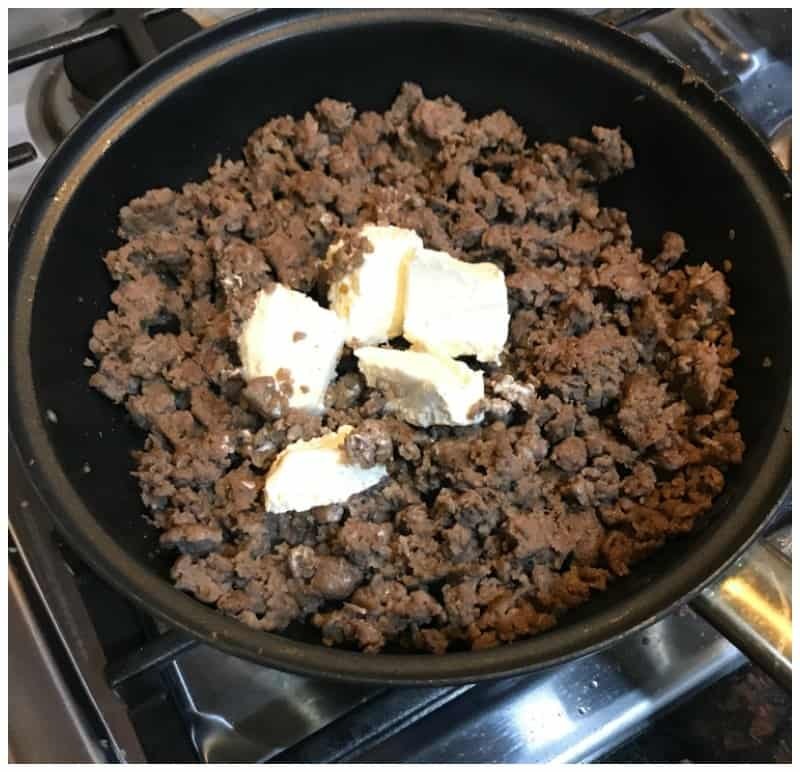 We decided to make Keto Sausage, Biscuits and Gravy! 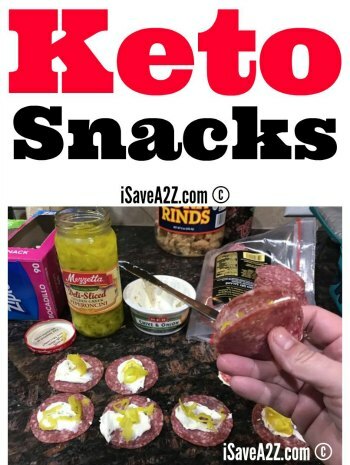 He started off frying up the sausage while I started to make Low Carb Biscuits Recipe that’s Keto friendly. The sausage we have has tons of flavor so I omitted the onion and garlic powder from this recipe. I might have added a bit more cheese to the recipe too. I couldn’t resist. Instead of a 1/2 cup of shredded cheese, I probably did more like 3/4 cup. I love cheesy biscuits! 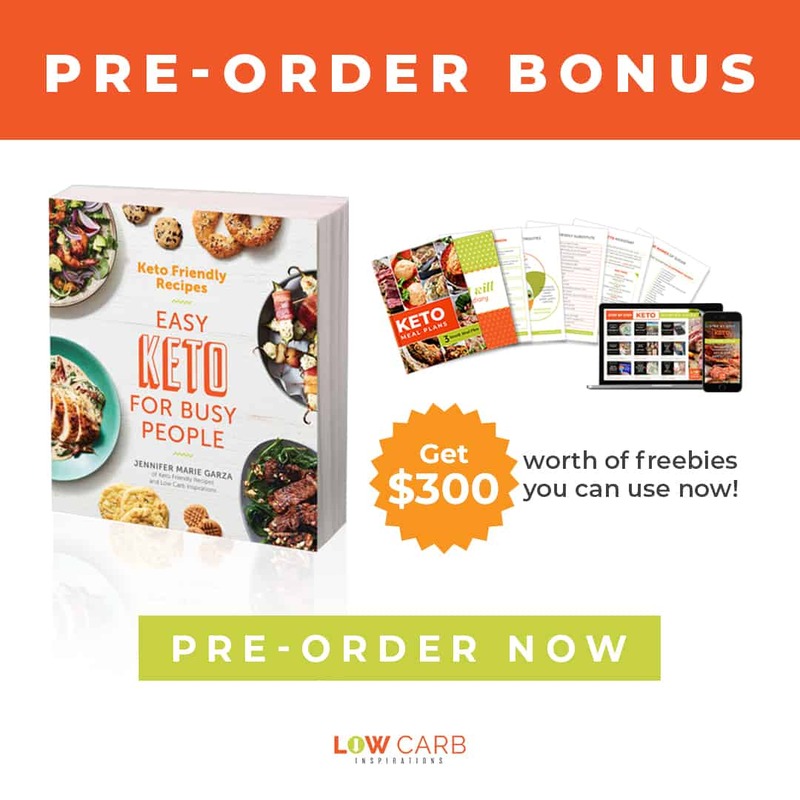 Once I whipped up those biscuits and got them in the oven, I took the next 10 minutes to complete the low carb keto gravy! Add 1 cup of heavy cream and bring it to a simmer. I had the gas top set at medium heat and this didn’t take but maybe 5 minutes for it to start simmering. Here are a few photos we took while making this recipe. This nutrition label is for the sausage gravy only. I used to think Keto pancakes or Keto waffles was my favorite breakfast but I’m pretty sure the whole family agrees that this recipe is #1! It doesn’t even taste like it’s a diet recipe. The flavor of this gravy far exceeds any regular flour type gravy recipe out there. Yes, it’s that good! My oldest daughter, who is college age, gave me the best compliment ever. She told me that she enjoys the Ketogenic diet but only because I make the best food! My heart melted! My kids are picky eaters, so this compliment is huge! HUGE! 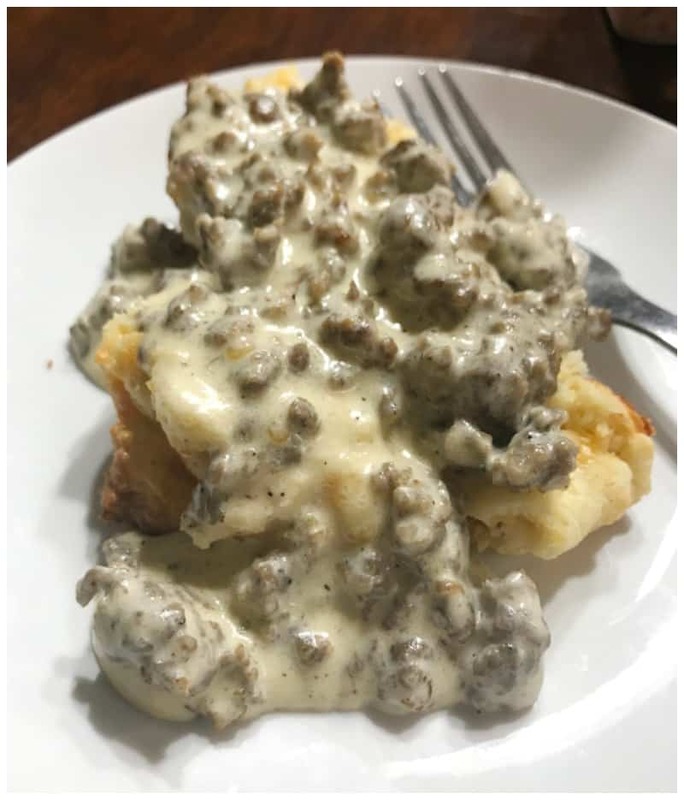 Don’t forget to pin this Keto Sausage, Biscuits and Gravy Recipe on Pinterest for later! Start off by frying the sausage until it's browned. Don't drain the fat. 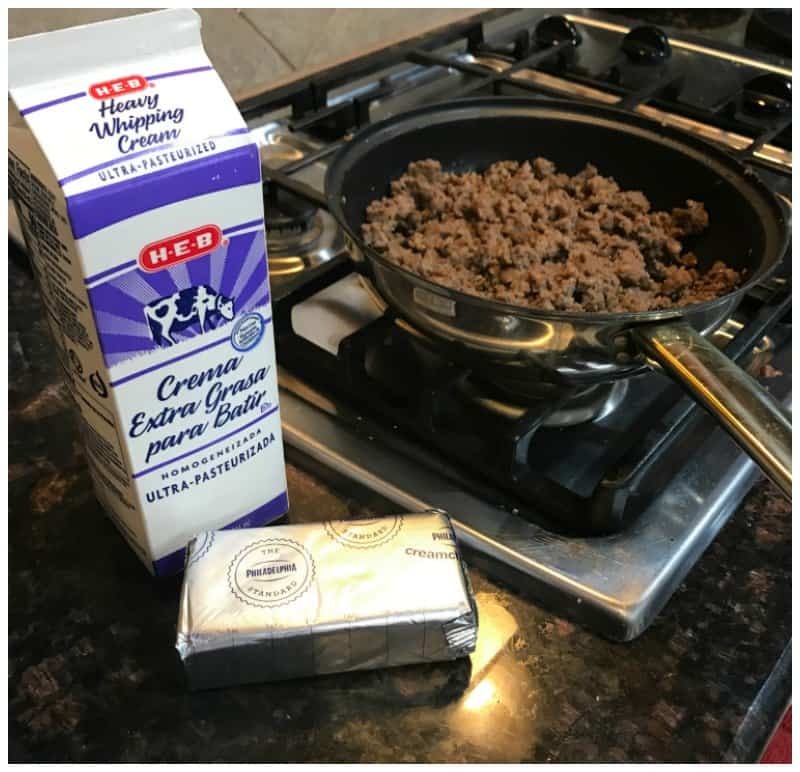 Add 3 ounces of cream cheese and stir until it's melted and combined. Add 1 cup of heavy cream and bring it to a simmer. I had the gas top set at medium heat and this didn't take but maybe 5 minutes for it to start simmering. 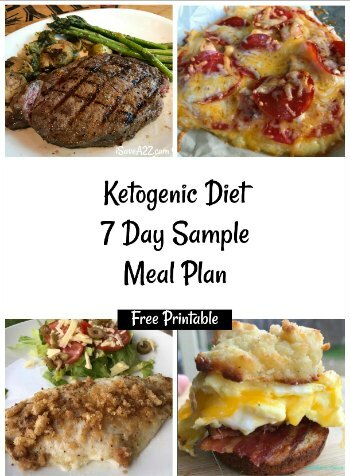 By Jennifer on December 18, 2017 Breakfast, Keto Breakfast Recipes, Keto Dinner Recipes, Keto Friendly Recipes, Recipes, Weight Watchers. Thank you, thank you SO much! I’m a Texan and my boyfriend and I have been doing Keto almost 2 months…he’s doing great and I’ve been desperately missing biscuits and gravy! This is so easy and delicious! I’ve sent the recipe to all of my girlfriends on the same weight loss journey and am so impressed I plan on getting the cookbook. I loved the first few bites until all I could taste was cream cheese in the gravy and sour cream in the biscuit . I was reduce the amount of cream cheese in the gravy to just 2 tbsp and less sour cream in the biscuits or maybe use cream cheese instead of sour cream . I would give this recipe a mother try with some tweaks . I made this ahead of time and took a spoon of it and it will work in a pinch when I think I have to have biscuits and gravy. I am not sure which one I am tasting most but I think it is the cream cheese. I wish it didn’t have that much of a cream cheese taste. Love this recipe! Quick, flavorful and as a lady in the south very picky when it comes to sausage gravy. You my dear, have hit it out of the park with this version. I made it as written adding only the garlic powder. Leaving the added salt out as well. This will be a regular in my breakfast and dinner rotation. I made this for dinner last night (who doesn’t like breakfast for dinner). My husband raved and said this is new favorite dish. This recipe is delicious. 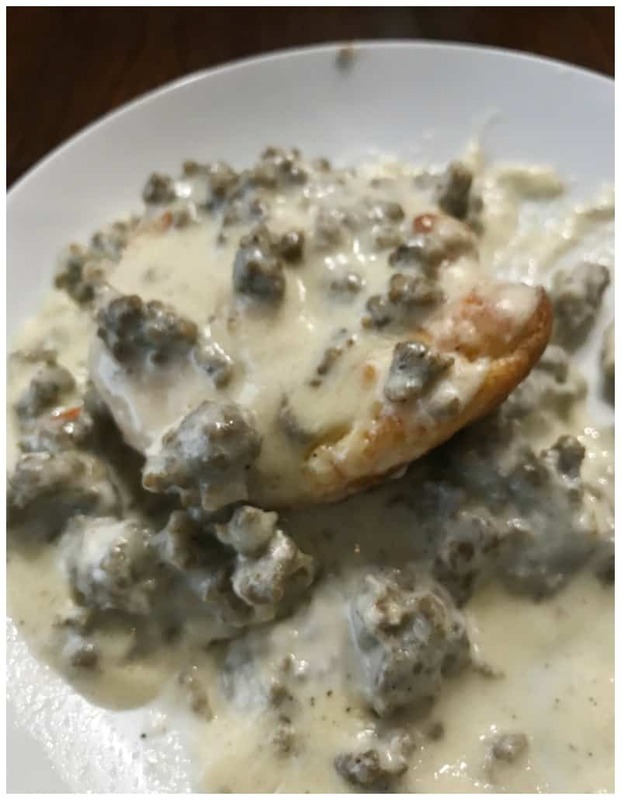 Much more satisfying than the old flour and milk sausage gravy and pairs perfectly with the keto low carb biscuits! 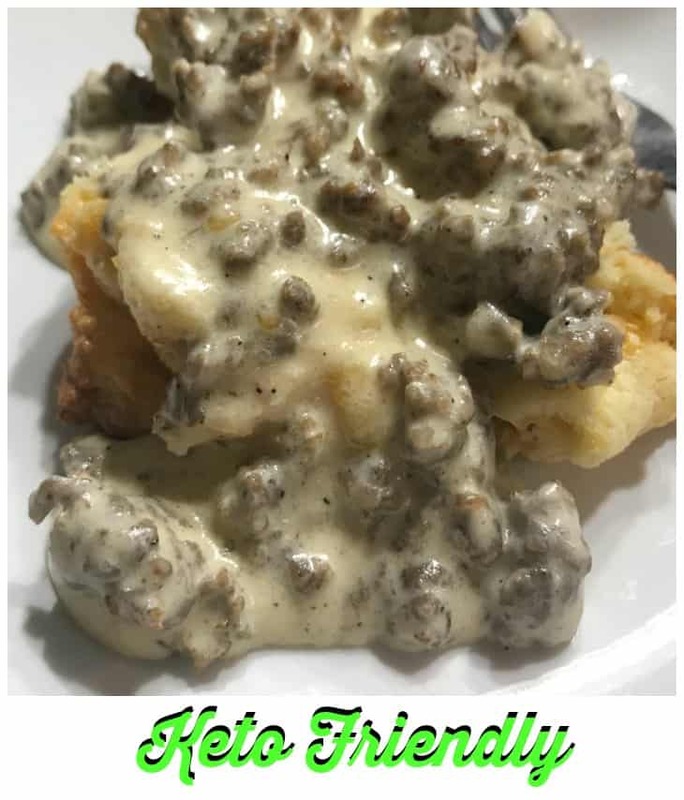 I consider myself a sausage gravy snob….most are just not good at all! This was absolutely DELICIOUS!!! Oh my gosh….maybe even better than my traditional gravy!! Thank you so much for coming up with this….I am in heaven! These didn’t taste low carb at all! Amazing! I’ll be making this often. The biscuits were so easy. Will they freeze well? So this was supposed to be a recipe on biscuits and gravy, but there’s no recipe for the biscuits. Can someone tell me what the biscuit recipe is? I forgot to mention that I used softened cream cheese in place of the sour cream for the biscuits. I didn’t have sour cream and I saw one of the commenters mention that she used cream cheese for the biscuits too and it worked well. Wow! Awesome, awesome, awesome 🙂 My husband had several biscuits and at least 2 servings of the sausage gravy. The biscuits remind us of Red Lobster’s biscuits!!! I added probably more like 3/4 cup of cheddar and I used sharp. Sharp cheese is good to use in these types of recipes (bread). 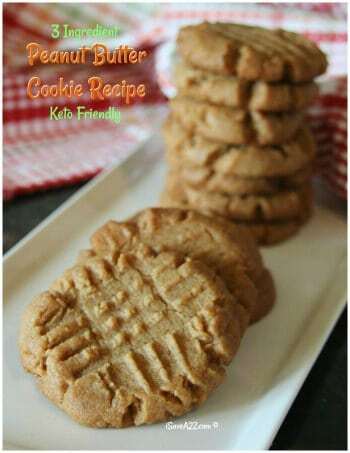 Thank you for sharing this wonderful recipe!!!!!!!!! Just wondering if anyone has ever altered this recipe to use an alternate milk option. Like would almond milk or coconut milk work instead of heavy cream? Also would daiya cream cheese work? I realize it may change the taste of this recipe but to be able to accommodate my not having dairy. I love this idea but who knows if it could work. Absolutely, delicious!!!! Will make again. OMG!! These we’re so good! The sausage gravy is just fabulous. Like great southern cooking. The biscuits were also great and complimented the gravy well. On their own the biscuits are cheesy good I’ll use these for dinner also. 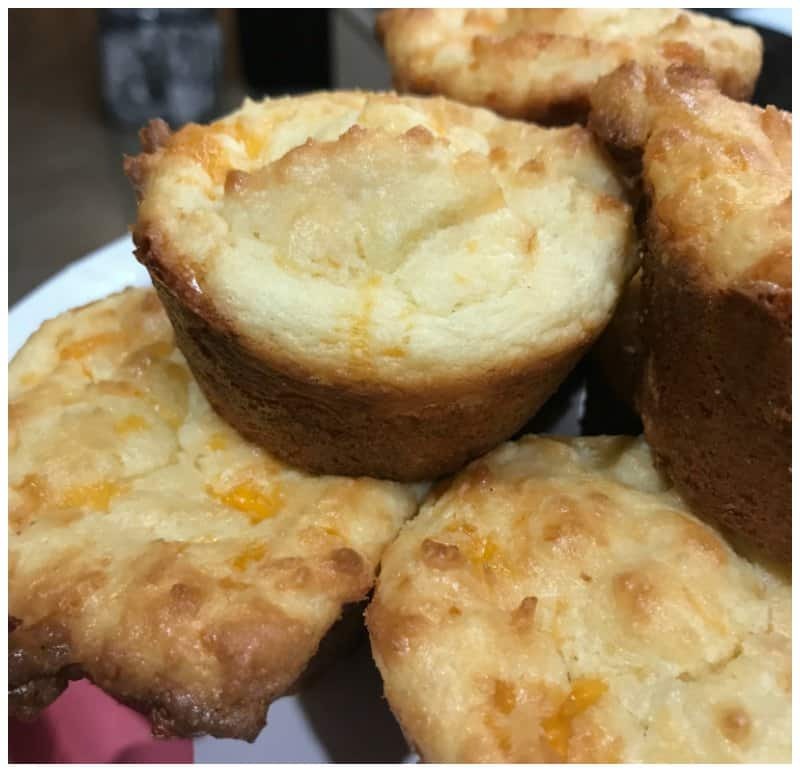 Thank you for the awesome Keto recipe!!! OMG…… this is awesome. I had no idea I would be able to have sausage and biscuits. Your biscuit recipe is the bomb as well. Definitely following you for your recipe So! Delicious!